The Eglise du Graal is located in Tréhorenteuc. This village is now located on the outskirts the Forêt de Brocéliande and a stone's throw from the Domain of Morgan le Fay. The site is considered the centre of black magic, as some say that her spirit still haunts the place. The Eglise du Graal - Holy Grail Church is the point of convergence of Christianity, Druidism and Arthurian Legend. The Eglise du Graal is enigmatic, as it is indeed the only church in the world dedicated to the Quest of the Grail. The inscription over the door in the south porch reads 'La Porte en est Dedans - The Door from Within' . It's the portal that leads to the discovery of the Grail and seems to invite you to a parallel world. 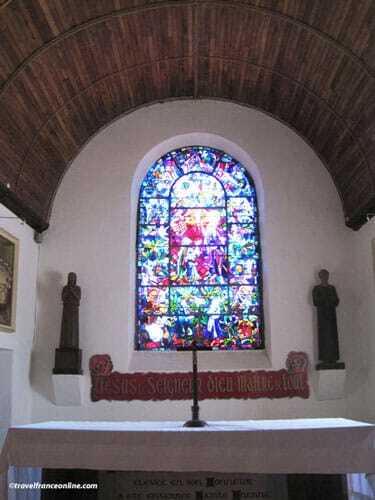 The Eglise du Graal's current decoration dates only from WWII, thanks to the initiative of its priest, Abbé Gillard. The priest decided to restore the church in a unique way. He wanted the Eglise du Graal to be point of convergence of various beliefs in order to unite the villagers around a single symbol. The Abbé Gillard succeeded, as Christian and Celtic symbols are systematically intertwined in the decoration. You'll find them in the paintings, mosaics and stained glass. He indeed hired the services of two German war prisoners in order to carry out his project. Peter Wisdorf and Karl Rezabeck were respectively cabinetmaker and painter. One carved the Twelve Stations of the Cross, the other painted them. Both artists took the villagers and the Abbé Gillard as models for the characters of the Way of the Cross. They found inspiration in the surrounding countryside for the backgrounds. 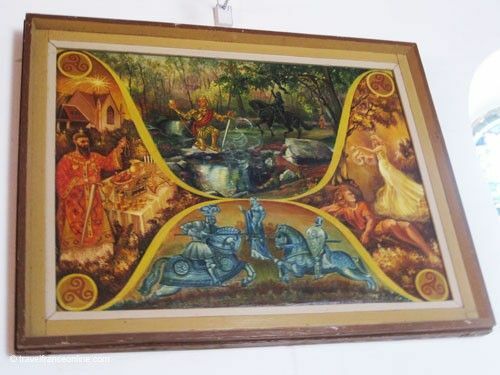 One of the paintings represents the Round Table and the Knights on each side of King Arthur. Karl Rezabeck also created the paintings of the choir. The themes are based on the appearance of the Grail to the Knights of the Round Table, and on the Royal Family of Saint Judicaël and Sainte Onenne. The broad mosaic of the narthex represents the stylized Fontaine de Barenton with the Perron de Merlin. 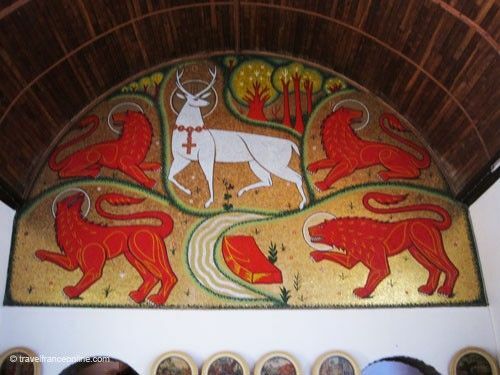 Four red lions surround a white stag (Cernunnos) with a gold collar. 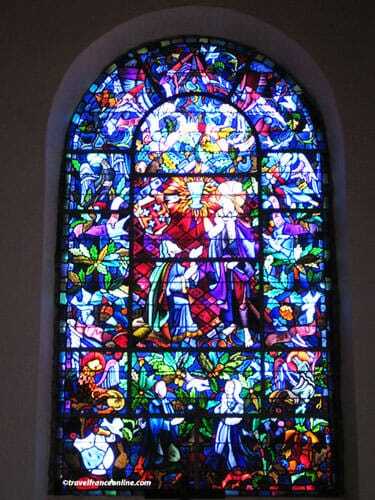 The priest also commissioned the colourful stained-glass windows in the choir. Their theme is obviously also focused on the mystery of the Holy Grail. 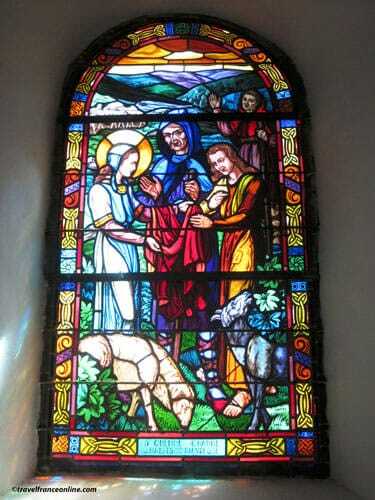 However, the other major theme is 'the life of Ste-Onenne', a major local saint and sister of Judicaël. 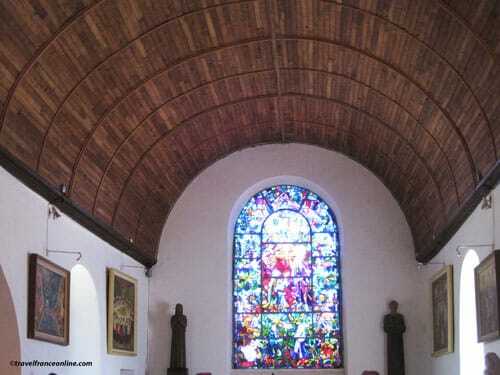 L'Abbé Gillard devoted over 20 years perfecting the Eglise du Graal. The result is quite stunning! You have to look for the symbols and interpret them.